"I don't care how you kill the little beasts, but do it! Do it now!" After spending decades mining the veins of fantasy and fairy tale, the Walt Disney studio turned to a contemporary story for its 1961 feature, 101 Dalmatians (or as spelled out on screen, One Hundred and One Dalmatians), based on the 1956 book by Dodie Smith. The modern story was mirrored by a far more modern animation style than Disney had previously utilized. With a memorable villain and some terrific set pieces, this cartoon stands out as one of the best of the pictures made in Disney's latter days. The story is narrated by dalmatian Pongo (Rod Taylor), who initially lives in London with his pet human Roger Radcliffe (Ben Wright). While securing a bride, Anita (Lisa Davis) for Roger, Pongo also secures female dalmatian Perdita (Cate Bauer) for himself. After they have a litter of 15 puppies, the youngsters are stolen by wicked Cruella De Vil (Betty Lou Gerson), who wants to make them into a coat, and has obtained 84 more dalmatian puppies for that purpose as well. After learning where the puppies are kept, Pongo and Perdita must make their way across the English countryside to rescue them. But Cruella and her henchmen will stop at nothing to get that spotted fur coat. The book was briskly adapted by Bill Peet, who unfortunately omits some of the English flavor of the story but the result certainly rattles along without stopping long for breath. It helps that there are relatively few songs that get in the way of the story. The main chase sequence of the 101 dogs making their way home does generate plenty of suspense, and the film offers one of the great "meet-cutes" of the movies. The dogs are given substantial personalities, although amusingly Roger and Anita are pretty much colorless in tandem with the conceit of the dog being the narrator. But what really makes the picture memorable is the central villain, Cruella. Graphically, she's monstrous, with hair that's half black and half white, smoking noxious cigarettes with neon green smoke, with her face a gaunt death's head that can evoke nightmares. Betty Lou Gerson offers a suitable loathsome voice that is full of ego and viciousness. It'd be a much less impressive picture without her. The modern setting allows the Disney staff to have fun with some satires of modern life. Among these are the presentations of dog-centered television shows, inane game shows, and commercial jingles. The satire is fairly gentle, however, without a nasty bite that would make them more effective. The mechanized world of Cruella with her limousine and the truck of her henchmen are in nice contrast to the bucolic world of the countryside and the parks of London where the dogs fit in. It's almost as if the villains are out of place, and this both provides them an opportunity for wrongdoing, and also proves to reveal their presence. The style of the animation is rather more simple than previous Disney features utilized, though the new xerographic process, which allowed the cels to be taken directly from the animators' pencils, gives an airy and lively sensibility to the art. In particular, the somewhat feathery pencils help make the appearance more organic, which helps with the stylized designs of the characters and especially the backgrounds, which are suggested with a few lines and semi-abstract splashes of color. While in lesser hands this could look cheap and be unpleasant, it works very well when run through the experienced hands of the Disney animators. Image Transfer Review: The film was apparently animated in academy ratio, for matting to 1.85:1 format when presented theatrically. The full-frame version is presented here, but it seems to look at least acceptable when zoomed in to a widescreen ratio. The picture is an immense improvement over the 1998 DVD, which was a recycled laserdisc transfer. Color is very vivid and there's plenty of interesting shading. There are two issues: the video seems to be flagged improperly, since there is frequently combing visible on the linework. In addition, there are signs of digital noise reduction doing harm to the delicate pencil lines; this is most clearly seen in the lines between the toes of The Colonel (J. Pat O'Malley), which flicker in and out in an annoying strobing fashion. However, the source material is immaculate and there's not so much as the slightest speckle visible. Audio Transfer Review: Both the original mono and a 5.1 remix of the soundtrack are included. The 5.1 has a broader soundstage but isn't noticeably more directional than the mono track. The surrounds are almost entirely devoted to score. The audio is crisp and clean throughout, however, with Roger's piano on Cruella De Vil coming across with splendid immediacy; the woodwinds on the orchestral score have excellent warmth, though the strings seems a shade thin in timbre. Extras Review: The content for this two-disc set is a bit lacking; since the feature only occupies a single layer of the first disc, most likely the entire package could have been put on a single disc with no harm to the content. 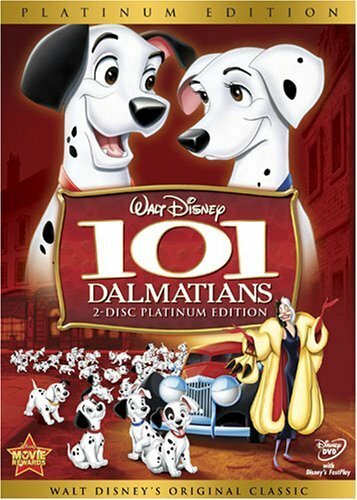 Oddly enough, unlike most other Platinum Editions, 101 Dalmatians lacks a commentary of any kind, though it does cover some of that territory through a pair of trivia tracks (which would have more conveniently been merged into one, frankly). The only other extra on disc 1 is a regrettable music video update of Cruella De Vil by Selena Gomez. The second disc offers a few items of meaty content. Best is Redefining the Line: The Making of One Hundred and One Dalmatians (33m:59s), which finally offers major credit to the work of Bill Peet in the storyboarding and character design. It also provides some information about the xerographic process, though more detail would have gratified the technically interested. The featurette Cruella De Vil: Drawn to Be Bad (7m:08s) is a welcome but all too brief discussion with Gerson and animator Marc Davis. It also reveals that the live action reference for Cruella was memorable character actor Mary Wickes. Sincerely Yours, Walt Disney (12m:36) is a re-creation of the correspondence between Walt and author Dodie Smith covering her issues with the adaptation and her meager screen credit. It's quite an entertaining little glimpse into the studio's relations with the outside world, something out of the ordinary for its usual work in public domain stories. Trailers and TV spots galore (plus three radio spots) demonstrate the evolution of the ad campaign over the original release and three rereleases, while seven galleries are packed with reference materials, the most intriguing of which include Peet's storyboards and the live action references for the various characters. A Music section offers six songs, three of which were deleted or abandoned, and three of which offer a variety of alternate takes. There are some interesting comparisons here, including the ill-conceived first version of the Cruella De Vil song. A "Games and Activities" section is underwhelming to say the least. There is a DVD-ROM "virtual dalmatian" activity that allows you to adopt a dalmatian puppy and play with it in various ways. There's a more limited version for set-top players hereas well. A "Puppy Profiler" continues the notion of the dog hero and asks the viewer several questions about his or her puppy persona to help identify the kind of Disney character who would make the best human pet. Finally, there's a "language game" for either very young children or non-English speakers that requires identification of a handful of words and numbers. The activity section will likely bore most children, though the Virtual Dalmatian may have some entertainment value. While it is a clear break with the past of the Disney studios, 101 Dalmatians is fun from beginning to end, with plenty of suspense and a great villain. The transfer is a little lacking, and the extras aren't quite up to usual Platinum Edition standards.